'Legerdemain' (Keith Keppel, R. 2007). Seedling# 99-168B. TB, height 34" (86 cm), Midseason to late bloom. Standards and style arms light blue (M&P 42-AB-5); falls vervain (42-B-6) center blending to parchment (12-B-3) toward edge, darker (12-B-7) at haft; beards white tipped orange vermillion (2-G-12). Seedling# 93-63F: ('Magharee' x 'Overjoyed') X seedling# 93-77A: (seedling# 89-99A: ('Witch's Wand' x 'Witches' Sabbath') x 'Romantic Evening'). Keppel 2008. Honorable Mention 2010. From AIS Bulletin #348 January 2008 Introducing LEGERDEMAIN ML 34" (Naughty Nights sib). Pale blue blend, falls shaded parchment, changing with weather and age. #99-168B. $45.00. Keith Keppel. jpg BHP_0919-X2_legerdemain.jpg manage 168 K 12 Feb 2016 - 07:50 BrockHeilman Please contact Brock Heilman for image use. JPG DSCN0038.JPG manage 68 K 11 Apr 2010 - 23:11 Main.bjacobs Photo by Betty Jacobs. Taken at Keith Keppel's iris garden. 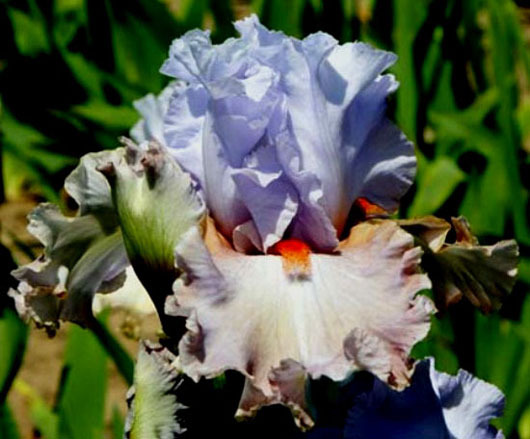 JPG LEGERDEMAIN1.JPG manage 141 K 23 Nov 2018 - 13:59 Main.TLaurin Photo by Debbie Carpenter-Iris Splendor Garden-Australia. JPG Legerdemain1.JPG manage 74 K 22 Jan 2019 - 23:22 Main.TLaurin Photo by Iris Sisters Farm.